John Louis Aull, 79, passed away Friday, November 16, 2018, in Durham, N.C. He was born on May 7, 1939, in Newberry, S.C. to Helen Ruth Lominick and Louis Eugene Aull. John is survived by his loving wife of 54 years, Judy Capps Aull, whom he adored, and his cherished daughters, Amber Kristina Aull and her husband, Bruce Alan Estes, of Enterprise, Ala., and Ashley Caroline Aull Dunham, of Salisbury, N.C. His love extended to brother James Michael Aull; grandchildren John Louis Gentry Dunham and Stanton Raines Dunham; nephew Kevin Michael Aull; step-grandchildren Timothy Alan Estes, Justin Eric Estes, and David William Estes; step-great-grandchildren Lula Grace Estes, Raylee Ann Estes, and Parker Alan Estes; and close friends Harlow (deceased) and Carol Daron and Del and Ann Williams. Simply said, John loved and was loved by many more aunts, uncles, cousins, extended family and devoted friends, colleagues and students. John grew up in Shelby, N.C. and attended the University of North Carolina at Chapel Hill, where he received a Bachelor of Arts in Chemistry in 1964. After marrying Judy, he spent four years active duty in the United States Navy as a commissioned officer and taught chemistry, math and physics at the Training Support Center at the Naval Station Great Lakes in Illinois. In 1968, John was promoted to Lieutenant and continued in the U.S. Naval Reserves. He and Judy returned to his roots in North Carolina, and he received a PhD in Biochemistry from North Carolina State University. He continued his training as a postdoctoral fellow at the University of South Carolina and in 1974, began his lifelong career on faculty in the Department of Chemistry and Biochemistry at Auburn University in Auburn, Ala. He was deeply respected by colleagues in his department and across Auburn University, gaining international recognition for his research in enzyme kinetics. He cherished his time as a mentor to many undergraduate and graduate students and was honored to have received numerous teaching awards during his 32-year tenure at Auburn. His last years at Auburn were his favorite, where he actively participated in the Science in Motion program, providing laboratory experiences for students across the State of Alabama. He retired as Professor Emeritus in 2006, and moved with his wife to Brevard, N.C., to spend time in the mountains with friends and family. 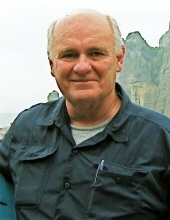 In his retired years, his love of adventure travel grew. He took many international trips with his wife and grandchildren, and tolerated beach trips to be with his family. His favorite moments in the mountains were spent working outside in the rhododendron bogs, chopping wood for the neighborhood with friends, enjoying single malt scotch with his scotch society, and telling outrageous bedtime stories to his grandchildren. We will celebrate John’s life later this year. In lieu of flowers, donations can be made to Give1fordad.com, a prostate cancer research fund at Duke University School of Medicine, or the Duke Heart Center Gift Fund at medicine.duke.edu/giving. To send flowers or a remembrance gift to the family of John Aull, please visit our Tribute Store. "Email Address" would like to share the life celebration of John Aull. Click on the "link" to go to share a favorite memory or leave a condolence message for the family.